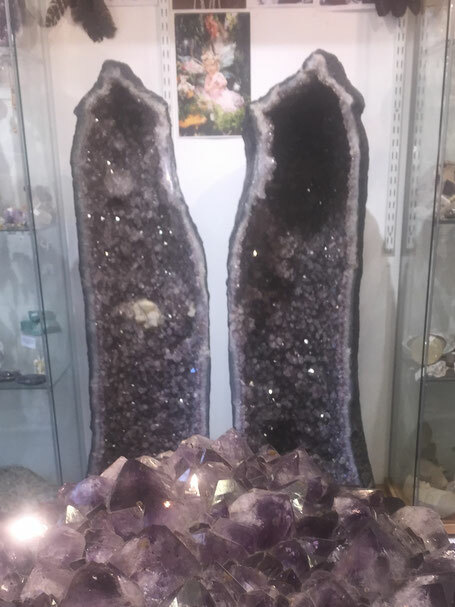 amethyst Geodes normally are no bigger than a football, some can form very large. These geodes are one point two metres high they were excavated from rocks in Southern Brazil near the border with Uruguay. geodes consist of a hollow rock lined with crystals. The geodes form from gas that was trapped the earth millions of years ago. Later, hot mineralised solutions permeated into the hollow cavity and deposited crystals. most are quartz based. The purple coloured quartz is called amethyst. The colour mainly comes from iron and manganese that is altered by natural radiation to give the purple colour.